The complete, official Message-Passing Interface Standard MPI-2.2 (September 4, 2009) is available in one book (hardcover, 647 pages, sewn binding). It was printed and is sold at cost by HLRS. Price is 19.50 Euro or 25.00 US-$ (shipping costs, see below). For all MPI programmer, the standard can be used as a complete MPI reference manual with many examples and advices to users. The last 19 pages contain several indexes to allow quick finding of all relevant information. Weight: 875 g = 31 oz. 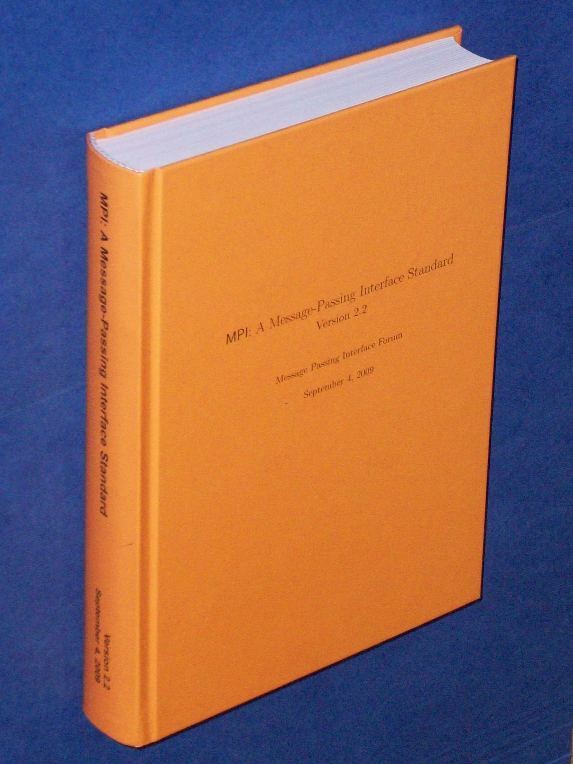 There are only a few remaining MPI-2.2 books and therefore we can provide shipping only through the interface above. Our apologies for any inconvenience about this.